How to Test & Measure Your Mac’s Performance. Mac Benchmark apps. How to monitor your Mac’s performance? How to tell that your computer works at its full? How to compare it to other machines with similar specifications? The answer: Mac benchmark tools. 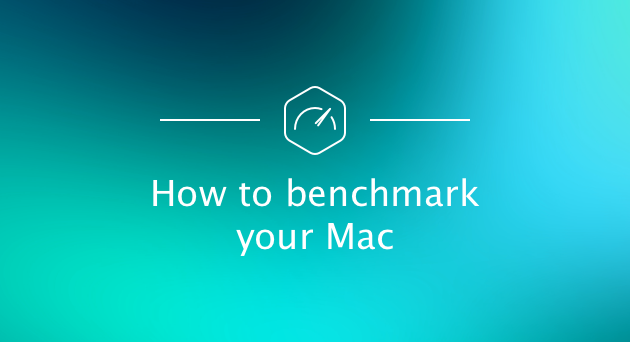 Benchmarking can help you understand the performance of your Mac’s software and hardware, including the disk speed, memory, and graphics card performance. This information is very useful as you can see the weak spots in your system that can be enhanced. Luckily, there are many apps that can help you measure how various components of your Mac work. And in this article, we’ll look at five tools that can help you test your Mac performance. You’ll know how they work and what they can measure. Plus, we’ll tell you about a utility that cannot only help you monitor your Mac’s performance but also improve its work and take it to a whole new level. So let’s roll! As you have already understood from its name, the Blackmagic Disk Speed Test measures your hard drive performance, in particular, its reads/writes speeds. It was designed to help video editors to determine if their hard drives can handle various video files. Blackmagic Disk Speed Test is extremely easy to use. It consists of a single window and a big Speed Test Start button. If you have a single hard drive, simply click the Start button and Blackmagic will test your hard drive and show the results. If you have multiple hard drives, you need to choose which one you want to test. To do that, go the Blackmagic’s settings by opening the File or Stress menus from its toolbar. Once you’ve chosen the hard drive, you may click Start to run a test. If you are looking for a good hard drive speed test on Mac, feel free to use Blackmagic Disk Speed Test. It is free to download from the App Store, so take advantage of this tool whenever you need. Geekbench is a useful app for measuring the CPU performance and memory speed on your Mac. It includes different tests that were designed to estimate how well your Mac can run everyday tasks. To start the Macbook performance test, you need to install the app, launch it, choose your processor architecture and click Run Benchmarks. When the test is completed, you can compare your results with other users. Don’t miss this great opportunity, it is really useful to see whether users on the same computer get the similar results. This may suggest that there is a problem with your Mac and what you should really expect from your particular model and hardware. You can try Geekbench for free, but if you want to get the full version, you need to buy it from the App store. Cinebench is a platform used to test two things: CPU and graphics card performance. It may be interesting for you to know that Cinebench is based on MAXON’s Cinema 4D animation software that is used for 3D content creation. MAXON software has been used in different popular movies, including Iron Man 3, Prometheus, and Oblivion. Main processor performance. Cinebench uses all your system’s processing power to test how quickly your processor can render a complex 3D scene that contains more than 2,000 objects, a great number of shadows, sharp reflections, and more. And the higher number you get, the faster your processor. Graphics card performance. This test uses a 3D car scene that shows the car chase. And to test the capabilities of your graphics hardware, Cinebench uses a great variety of different effects and textures. The higher the numbers, the faster your graphics card is. Cinebench is free to use, so if you need to run a CPU speed test Mac or measure your graphics card performance, try it out. Novabench is a free tool that provides Mac benchmark test for your whole system, including CPU, RAM and graphics performance. Click the Start Tests button. Novabench will start running different tests. Wait 1-2 minutes for the tests to run. Don’t use your computer during the tests. Get the results of each test along with the Novabench score (the higher the number you’ve got, the better). Once you've tested your computer performance, you can add results to your profile or keep them private. If you want to share results with others, click the Submit and Compare button. Novabench is easy to use and provides a quick way to test Mac performance. 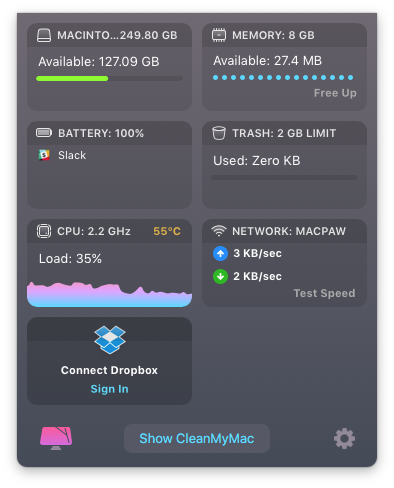 While the apps mentioned above are designed to measure Mac performance, a utility like CleanMyMac X can also optimize your Mac and improve its efficiency. If there’s a problem with your Mac, the app will let you know immediately and help you with the fix. You get alerts when apps stop responding, disk temperature is high, the memory use is unusually heavy, and battery status is critical. With CleanMyMac X, you always know if your Mac is running well and can fix the problem as soon as it arises. CleanMyMac also has the Maintenance module that gives you access to all Mac optimizing goodies: running maintenance scripts, repairing disk permissions, verifying startup disk, running Mail speedup, reindexing Spotlight. All those things may sound a bit complex, but don’t worry: CleanMyMac X is extremely easy to use. Just run a scan of your whole system and the app will tell you what should be removed to boost your Mac performance. The scanning and cleaning process requires just 2 clicks and less than 5 minutes. Impressive, right? Good news, CleanMyMac X is free to download. So give it a try and boost your Mac’s performance! That’s it. We hope our article was useful and you’ve chosen a Mac benchmark tool that works best for you. Thanks for reading and stay tuned!